WinSQL supports several comments that are meant to enhance the functionality of queries you write. This page lists those comments. All of these comments are Line Comments. In other words, they start with two dashes. -- wn_NamedQuery Specifies a name for a Named Query. This value is useful when you try to save a named query. -- wn_PageTitle Specifies a name for current Query Page. -- wn_SaveToCSV Saves the results of a SELECT query to a text file in CSV format. This comments takes a file name as parameter representing the path for the output file. -- wn_SaveToHTM Similar to CSV, this comment saves the output of a SELECT query to a HTML file. 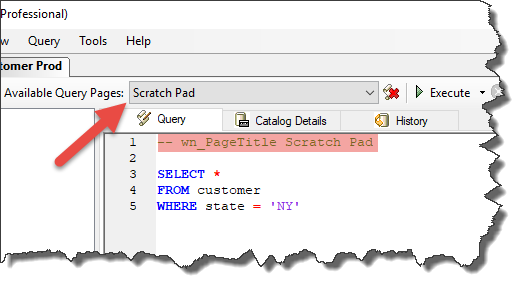 -- wn_ShowColumnInfo Displays the metadata for a SELECT query. -- wn_TabTitle This is a convenient way to specify a title for the tab in the grid. This becomes useful if you need to save the contents of a result grid. I just found out about these special comments and I think it's a great idea. I just hope they were not only working when the query is run in grid mode. It would be very nice if "wn_TabTitle" could be used in text mode to give the query results a title.